The First And Only Human Deaths In Space Were The Crew Of The? To Aid In Maintenance Urban Planners In Melbourne Australia Assigned Email Addresses To What City Feature? Since the start of the space race in the mid-20th century, there have been more than a few space flight-related fatalities. The nature of the fatalities over the previous decades starkly highlight the riskiest element of space travel: going to space and returning. Nearly every astronaut death has occurred either on the launch pad (as with Apollo 1 in 1967), during ascent (as with the Space Shuttle Challenger in 1986), or during re-entry (as with the Space Shuttle Columbia in 2003). Much like terrestrial flight, the vast majority of space travel-related accidents occur during the lift off and touch down phases of the trip. The single exception to this pattern is the sole instance of a crew dying in actual space, as opposed to in Earth’s atmosphere: the crew of the Soviet space mission Soyuz 11. 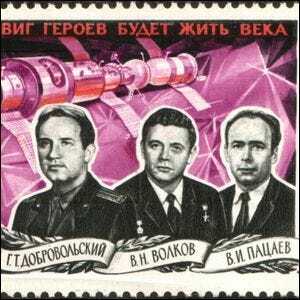 In 1971, the crew—comprised of Georgy Dobrovolsky, Vladislav Volkov, and Viktor Patsayev—was killed when an erroneously opened valve depressurized the crew capsule during preparations for re-entry. The men asphyxiated almost immediately and were already dead upon re-entry. The tragedy led to an extensive redesign of the Soyuz spacecraft so that cosmonauts aboard the vessel could wear pressurized suits in order to avoid any future tragedies caused by a loss of cabin pressure.